In the spring of 2003, coalition forces were called to secure the banks in Basra, Iraq. During the operation, they discovered a collection of brilliant, uncirculated Iraqi coins that were decommissioned by Saddam Hussein at the end of the first Gulf War. Although the coins could not be used for monetary purposes, they came to symbolize freedom and the sacrifices made to preserve it. The coalition forces wanted them to be a part of doing something good. So they decided to auction off the coins and use the proceeds to rebuild an orphanage in Basra that had been destroyed during Saddam's reign. Products for Good acquired the coins and developed a line of products that give everyone a unique opportunity to honor and express their gratitude to our men and women in uniform. These patriotic gifts are assembled at Cleveland Vocational Industries, a facility in North Carolina that provides employment for mentally and physically challenged individuals. A: Typically orders will be shipped within a day or two (unless the shipping guy is on vacation). If your order is for an engraved shadowbox, the shipment can take up to two weeks. Q: Do the coins have spendable value? A: The coins are Iraqi Fils that were decommissioned and removed from circulation by Saddam in the early 1990’s at the end of the first gulf war. 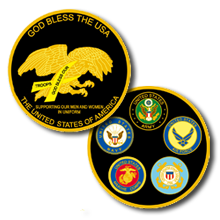 While they do not have a monetary value the coins are a symbol of freedom and serve to remind us of the service and sacrifice of our men and women in uniform. Q: Are the coins uncirculated? A: Yes. All the coins featured in the shadowbox sets are Brilliant Uncirculated (BU) and are not removed from their original mint bags until placed in the shadowbox. Q: What are the coins made of? A: The Iraqi Fils are made of copper-nickel and stainless steel. Q: Is it legal to sell these coins? A: Yes. Instead of being destroyed, our coalition forces agreed to sell these decommissioned coins to raise money for a Basra orphanage and to rebuild the Basra War Cemetery. Products for Good purchased the entire collection of coins with the intent to create as many good works as possible. Do you have a question we haven’t answered? Submit your question below and we will respond in a timely manner. Thank you for your interest in Products for Good. I'm an Army First Sergeant serving in Iraq. I was home on leave in early October 2005 and saw a special on GAC with Lee Greenwood, and I am pleased to say I have ordered my shadowbox as a keepsake and memory of my time serving this wonderful country we all call home. Thank you for doing this for our fallen servicemen and -women and their families. Keep up the great work.